Firefox: Go to Tools -> Addons -> Extensions -> AdBlock "Disable or Remove". 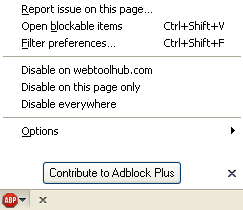 Chrome: Right click the AdBlock toolbar button and choose "Remove from Chrome". Safari: Click the Safari menu -> Preferences -> Extensions -> AdBlock Uninstall. Opera: Click the Opera menu -> Extensions -> Manage Extensions -> Uninstall. 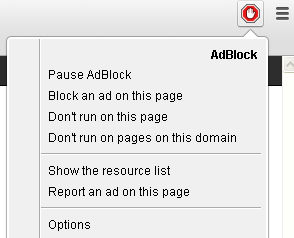 Firefox: Click on the AdBlock icon in lower left corner (addon bar) and choose to "Disable on ..." as shown below.